The Guest user team role is perfect for clients, colleagues and stakeholders who need to see design projects, open and comment on designs. What can Guest users do? The Guest user team role is perfect for clients, colleagues and stakeholders who only need to open and comment on designs. These users cannot add new designs or use the inspection tools. How to invite Guest users? 1. Make sure you're either in the Company plan or in the Enterprise plan. If you're in the Company plan, you can invite up to 5 Guest users at no extra charge. If you're in the Enterprise plan, you can invite an unlimited number of Guest users at no extra charge. 2. Go to your Team settings (or just hit Invite people) and add new e-mail address. NOTE: You can also invite multiple people at once, but if you want to give them different roles or permissions, you need to invite them one by one. 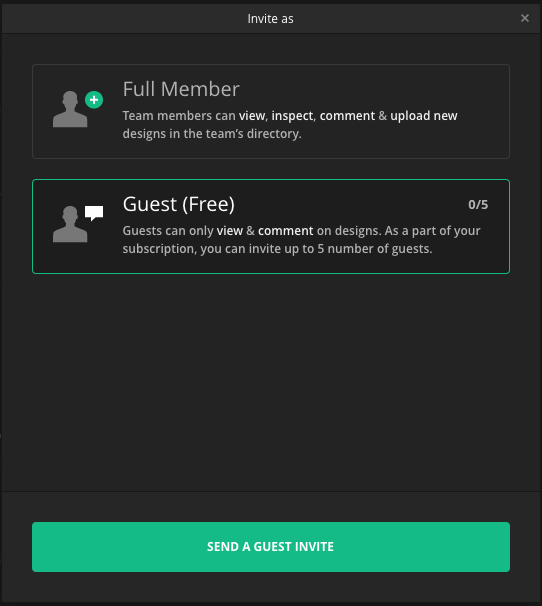 Once you send the invite, the Guest user has to accept it and create an Avocode account to join your team. Until then, the invitation is pending. You can always change the project permissions of any Guest user. Just go to your Team settings, click on the cogwheel next to the Guest user and click on Edit permissions. NOTE: You can even edit the permissions while the invitation is pending. 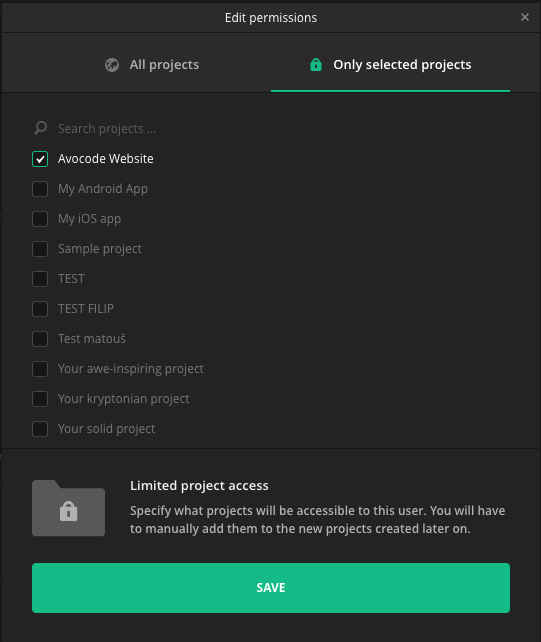 Then select the projects which you want the Guest to be able to access and hit SAVE. Once the Guest user has accepted the invitation, you can make them a Team member. A Team member is able to add new designs and inspect designs. A Team member role is paid, therefore your subscription will increase by the rate of your current pricing and depending on your billing period (monthly/yearly). NOTE: You can learn more about how we prorate for adding/removing team members here. If someone from your team doesn't need to add new designs or inspect designs, you can always convert them to a Guest. If you do so, your subscription rate will be decreased depending on your pricing plan (and prorated depending on the time in the billing period).